Wow Joe! It's going to be sweeet! I will come by and check it out one of these weekends soon. anytime ant. Just hit me up. Got my final load of parts back from the dustless blaster today. Had to get them cleaned up and in epoxy asap. Parts included my factory wheels and an extra one that will be up for sale, rad support, header panel and brackets, my buddies olds wheels and a part for my mini log splitter. 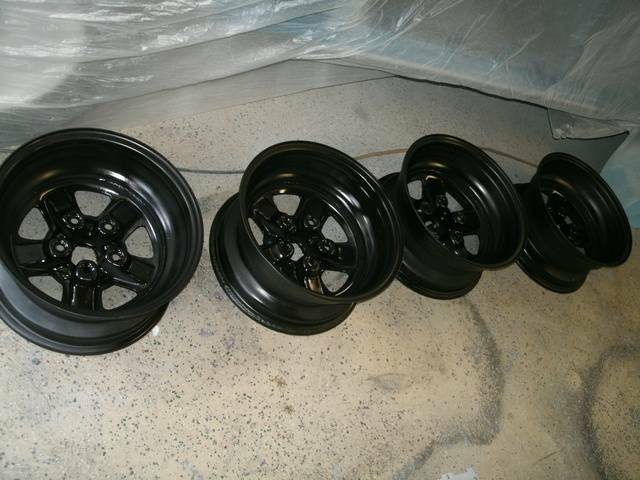 The olds wheels were shot with black epoxy since thats the way they came from the factory. They will be getting Argent Silver on the front along with mine tomorrow morning. Two coats on everything with SPI epoxy. 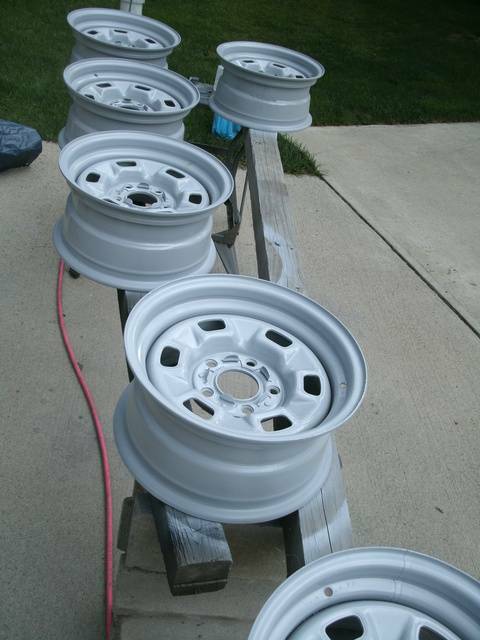 I also shot my quarters with their final coat of primer this morning. 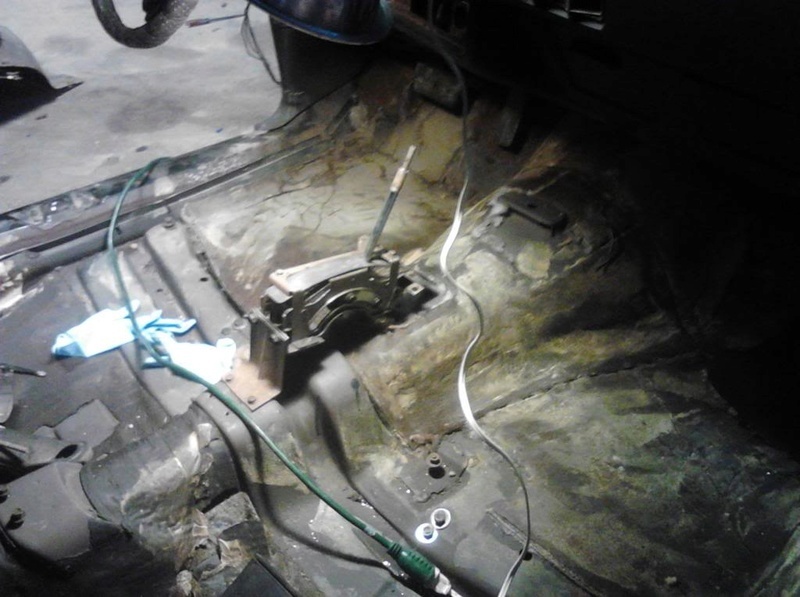 I just have to glass blast my mounting bolts for the fenders and I"ll be reassembling the doors, fenders, hood and trunk lid. 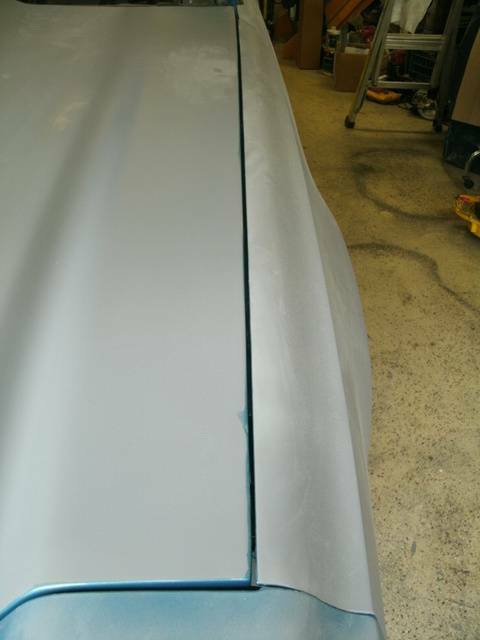 I have some Zolatone Black/Aqua coming to shoot the inside of the trunk like factory. No clear coat required on the zolatone and its real durable. I also taped off and glass blasted my center caps and shot them with Argent Silver. Just shot the stock wheels this morning. Just have to re-mount up my G70-14 on the spare, shoot the zolatone and put the jack back in the trunk. 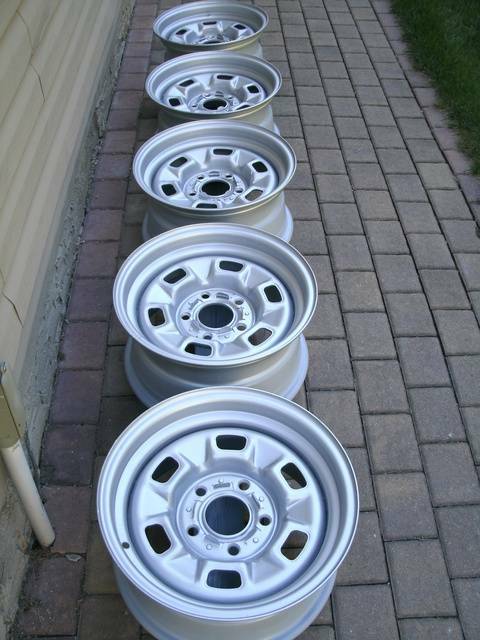 The other (4) wheels and center caps are going into storage. Clanceman, just in case you want to know. 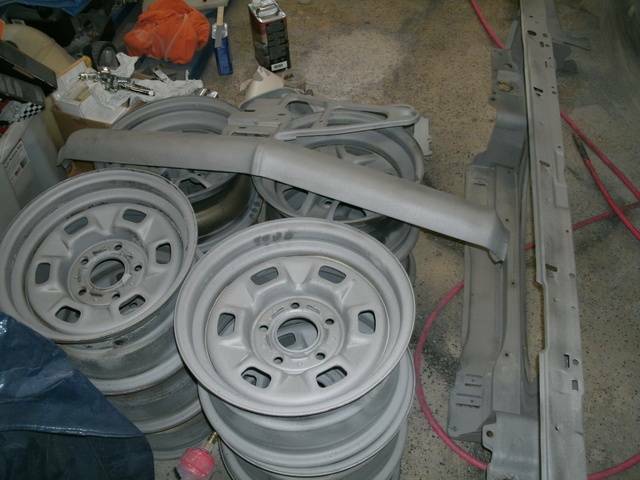 The automotive paint company Pro-Spray (Argent Silver) and U-Pol 808 spray cans are an exact match to our factory wheels and to each other. Just FYI. Nice work Joe. It's going to be one sweet ride when it's done. Of course we all know our cars do not bring, or command the price of an older Chevelle, unless it's a super rare one. Instead we build ours to be enjoyed by ourselves and in hopes of putting a smile on some faces and bring back memories of times gone by to others. We do this all for the love of the car, and the hobby it represents. Keep up the good work Joe, and all others here on this forum. Thanks. I'm not doing it for any value what so ever. I just wanted to do it again and change some things. I did this in the late 80's as well. 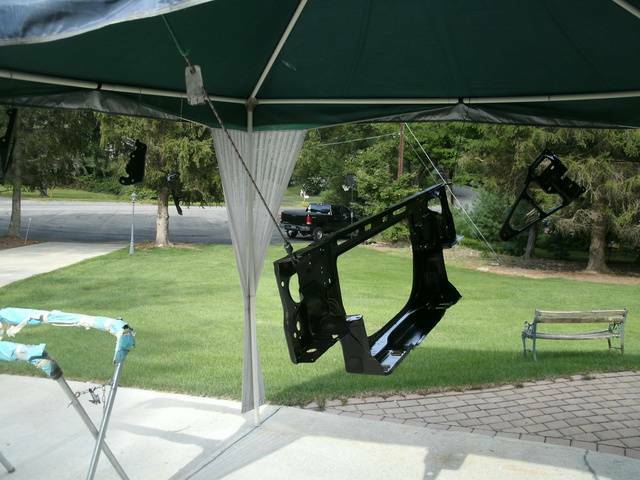 Thats when I installed the galvanized frame and control arms. Its just fun for me. 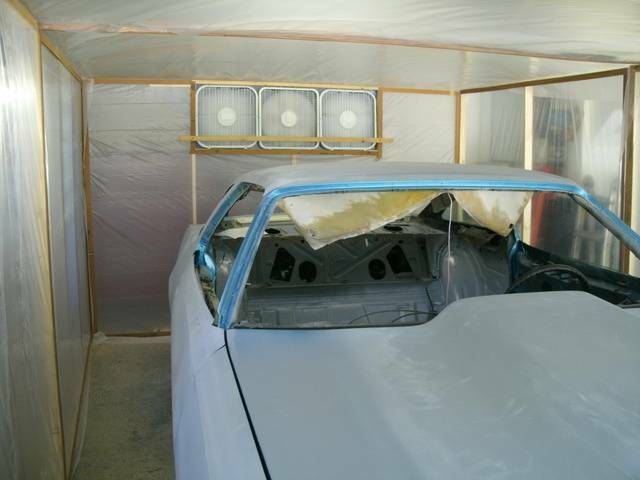 I took alot of rippin from some of my buddies when I told them I was stripping it to bare metal AGAIN. But I did the bottom too this time. For me, I think its coming out beautifully. This is definitely the last time I'm doing it. LOL. The only other mod that may come way down the road would be an Auto Gear overdrive box. The 4.10s are not very streetable and definitely no highway. But boy is it fun punching it. Todays work is done. 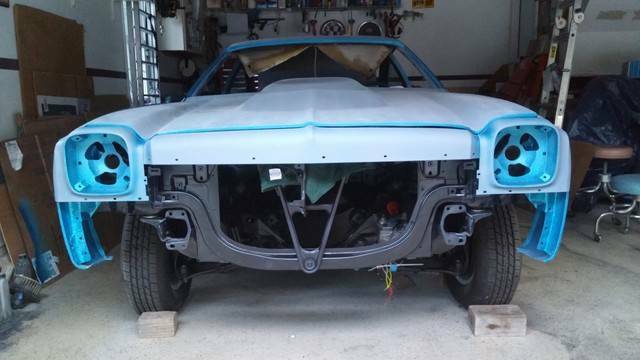 Doors are on and aligned, trunk lid is on and aligned, front fenders are on with rad support of course. Rad support was squared with rear fender bolts as an extra check. Was only out 1/!6". Pass fender is aligned, I'll do the drivers tomorrow. If you ever feel like doing it again then do it. I know guys that has done Their cars over every 10 -15 years, changing style according to the fashion of the day. Or you could do an elcamino next time. I would like an elcamino next to my chevelle for hauling parts. Also a station wagon with a 454 alon side the other 2 would make it perfect. 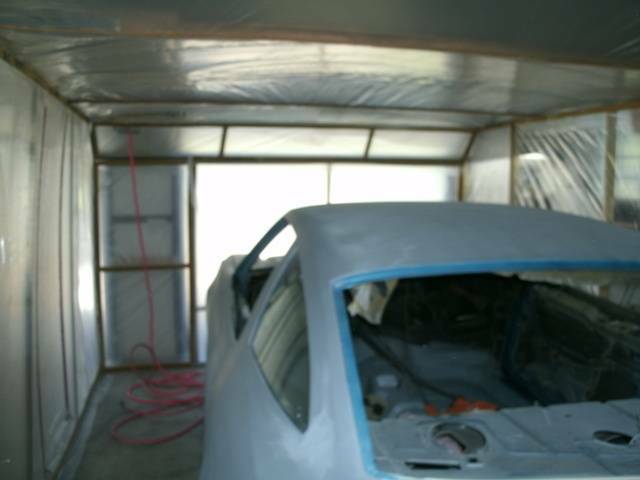 I cant wait to see your car done it is going to be Nice, and it makes me want to do mine again. Keep up the Nice work. Ok, its getting there. I have about 14 hours into this glass hood. I had to add a little glass to the sides to tighten up the gap a bit. 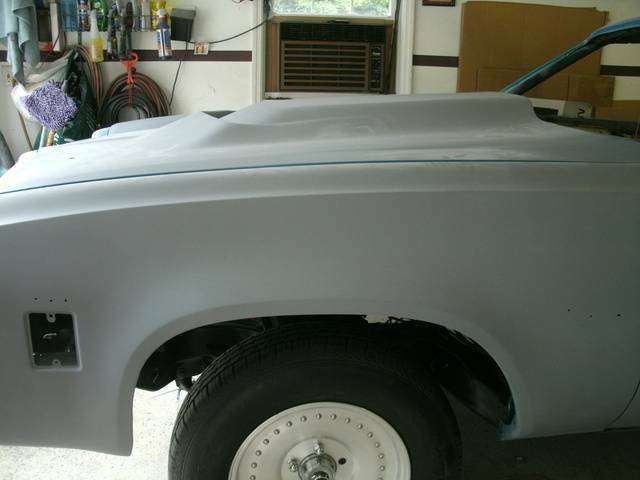 Then re-epoxy, (2) coats 2k primer, then I hit the edge with blue and clear AGAIN. I sanded and re-shot the satin black on the tail panel and it looks real nice. 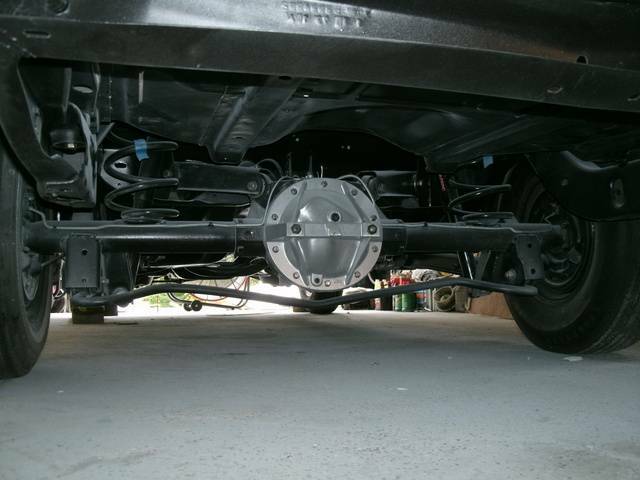 Then I took a quick shot of the underneath from the rear. Alot of dust everywhere. Tape on the rear springs are for me to eyeball spring pig tail orientation. Cut ends are supposed to parallel to the centerline of the car and pointing to the passenger side. 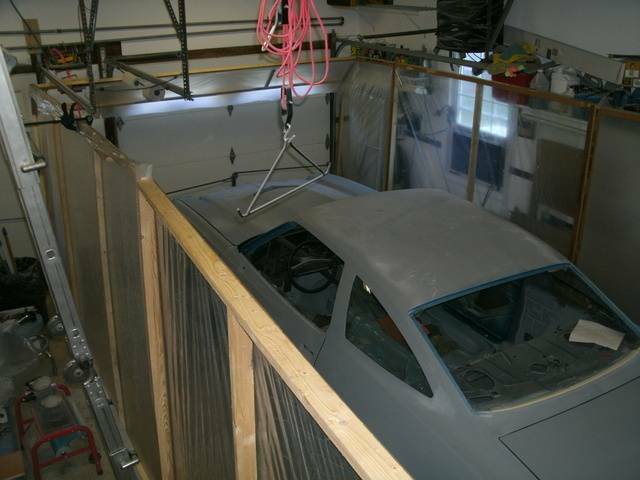 Just have to put in the door latches and strikers then I will be building the paint booth. Getting close. 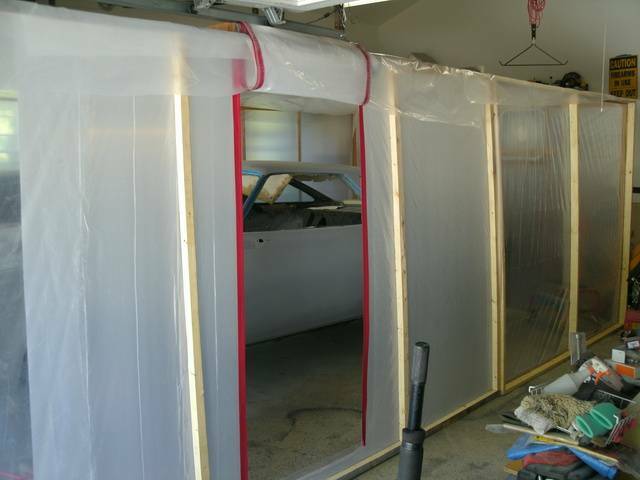 Ok, I built a paint booth. Its 20 feet long and a hair under 11 feet wide. I designed it to fit in a normal garage with a normal 8 foot wide, 7 foot high door. The garage door will close normally. There are intake AND exhaust filters. I did not use the pleated house style filters that most guys use. I purchased actual paint booth filter material 24" roll from Amazon. 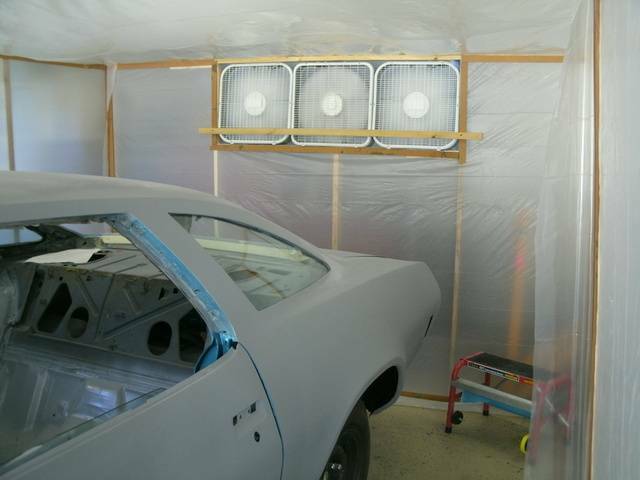 These paint booth filters are slightly tacky and can catch particles as they try to pass. But as they collect particles they do no restrict air flow which is what I was looking for. I used 3 pieces of it so I have one piece left over in case I need to change one out which I doubt. 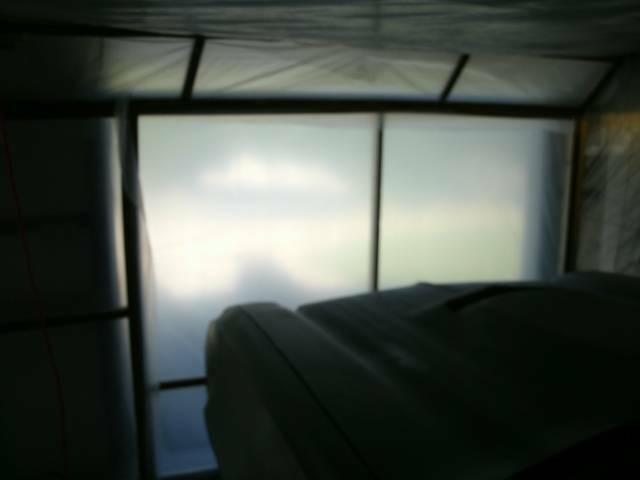 This is a pressure style booth which has (3) 20" fans (with filter material on their intake side) blowing INTO the booth to pressurize it. Fans are located high on the rear wall. Exhaust filter is located low on the front wall. It pressurizes nicely and you can feel the air current as it moves along the booth. You can also feel air coming out of the exhaust filter on the outside. I actually checked the air flow by using some of my "wind indicator" powder that I use for bow hunting. Basically like an eye dropper bottle with talc in it. You squeeze it and it puffs fine talc into the air. Tells you which way the air is moving. And its moving nicely in the booth. 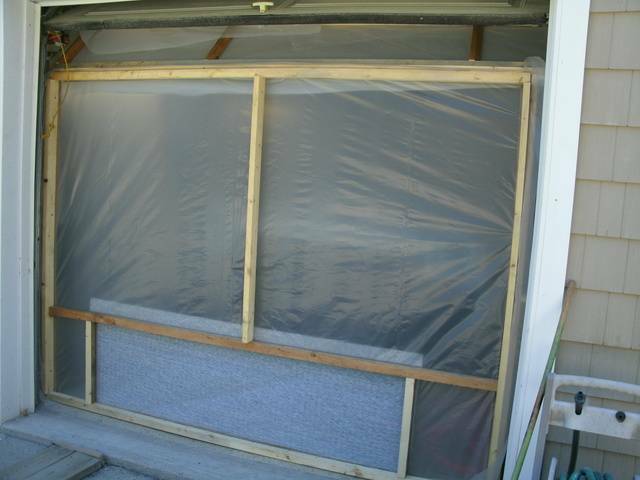 The booth is made in panels so it will be easy to take apart, stack side by side, and screw a piece of wood on the top and bottom to make a pack for easy transport. The roof is not a panel but normal 4 mil plastic with 2 support cross braces. There is a zipper kit installed (red vertical lines on the plastic) for easy in and out. I doubled up the plastic on the bottom of the zippered area for extra strength but to also add a little weight to the door. The extra plastic overhangs the bottom of the door so when the fans are on the door seals nicely. If anyone is local to the New York area, I will be selling this booth after I'm done. If anyone wants to come take a look at it and see how it works, just PM me. I have a pick up truck and I am willing to meet up for people driving longer distances. Now I just have to do a last block sand, mask off and I can shoot. Spraying should take about 3 days to allow time for masking of the stripes. 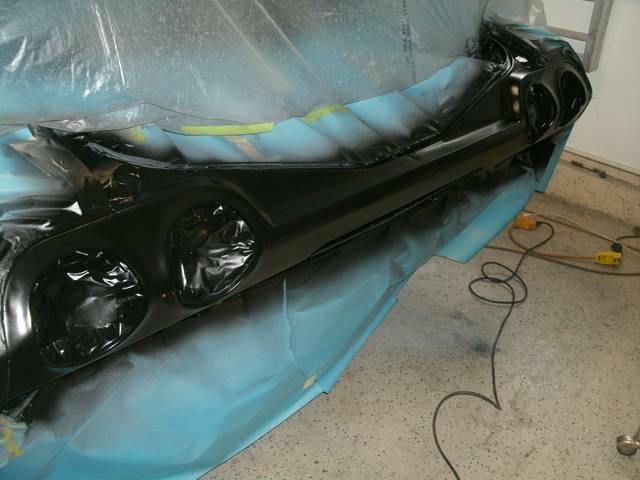 Then I plan to let the clear sit at least 3 days and I'll be block sanding it out again and shooting 2-3 flow coats for the final gloss. Here's some pics. The pics are with the fans running and the booth pressurized !! Joe, you show why people don't need to spend mega bucks on having a car built by a shop. I know that it's not cheap to do what you have done so far in the least. But it does show that if one has the patients, use your head, and willing to do the work, you can turn out just as good of job as a pro shop does. My hat is off to you sir. Can't wait to see it in color and finished. Thank you very much Jeff. I appreciate it. The paint that I removed (lacquer I sprayed in 1989) won me 3 trophies for paint back in the day. Now with this urethane technology I have high hopes for an even better job. Fantastic job Joe, I cant wait to see the finished product. Before you paint please make sure you have not used any lubricants that contain silicone in your shop or on your car as well as any deodorants/aftershave etc for yourself, even a small airborne cross contamination can cause problems. I'm sure you know this already but thought I better say something just incase. Can you post a picture of your floor? Would like to see the 4 speed hump and the swivel bucket seat mounting holes and console mounts. Tempted to do a 4 speed conversion on my 73 SS wagon. 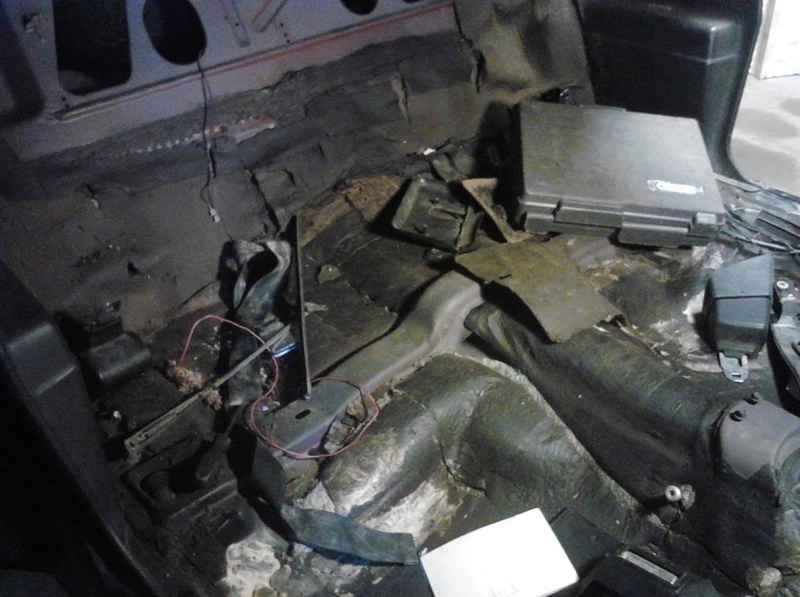 Have all the interior parts to change over. 1975 S3 wrote: Fantastic job Joe, I cant wait to see the finished product. Before you paint please make sure you have not used any lubricants that contain silicone in your shop or on your car as well as any deodorants/aftershave etc for yourself, even a small airborne cross contamination can cause problems. I'm sure you know this already but thought I better say something just incase. Maybe something like this dime73ss? Cool i can get the hump. Would like to see how it looks installed. Also like to see about location of swivel bucket seat floor mounts. Know one side where seat belt mount and front will work but the inside bolt or hole locations near the console. Dine, my car is a factory bench 4 speed.car. So no console. It had swivels in it when I got it. And the.original owner gave me the original bench for.it. So my floor only has.the.bump. I ground off the tabbed.swivel mounts. I actually have the.factory swivel mounts that go on the crossmember. I saved them, blasted and acid.etched them. I put them in storage with my swivels. 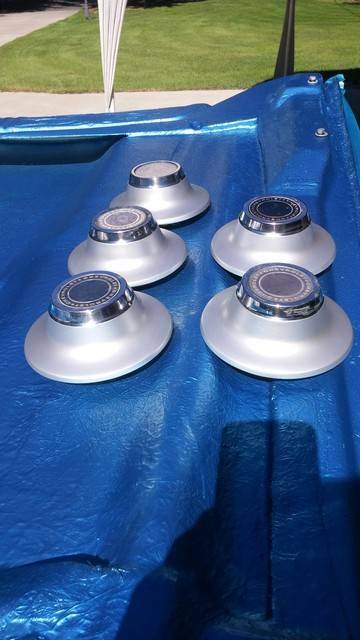 Someone on the board posted a pic of All the swivel mounts. The rear ones near the trans tunnel are on a plate that lays over the trans tunnel in the back. dine73ss wrote: Cool i can get the hump. Would like to see how it looks installed. Also like to see about location of swivel bucket seat floor mounts. Know one side where seat belt mount and front will work but the inside bolt or hole locations near the console.